On Saturday 22 September 2018 the choir was joined by Jeneba Kanneh-Mason, Keyboard Category Finalist in BBC Young Musician 2018. 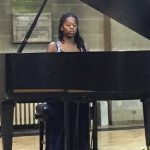 Jeneba’s programme of classic piano pieces was breath-taking and raised the hairs on the back of the neck. Her performance closed with the Prokofiev piano sonata no.7 3rd movement which brought the audience to a spontaneous standing ovation. 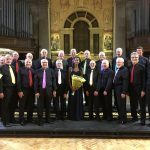 No doubt spurred on by sharing the stage with such a talented pianist the choir was on top form, delighting the audience with a varied selection of songs from their repertoire. 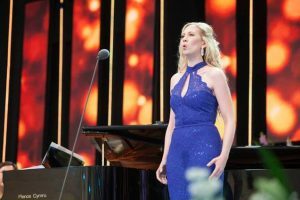 The choir, who always enjoy singing with Charlotte Hoather, most recently as our guest soloist at the Patron’s concert in June, were delighted to hear the news that she has been awarded one of the main prizes at the world famous Llangollen International Musical Eisteddfod. 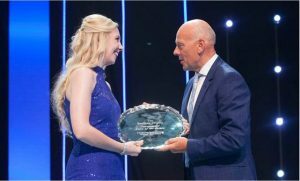 She won the title of Pendine International Voice of the Future , singing on the main stage in the Pavilion in front of a packed audience. In addition to a cash prize of £5000, Charlotte was presented with the brand new Pendine Trophy. Congratulations Charlotte, and we look forward to singing with you again in November. The choir’s concert, shared jointly with Burbage Band (Buxton), has been selected for an Award by the 2018 Buxton Fringe. Tonight’s stage at the Methodists’ Church was shared by two great musical institutions of the town resulting in a wonderfully entertaining evening. Though quite different in emphasis, both organisations have in common a long history of fostering music learning in their communities, accepting novices and working towards achievement of a commendably high standard of musicianship. 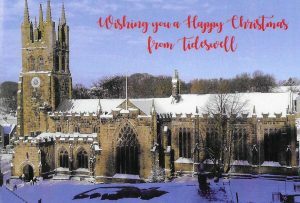 Tideswell Male Voice Choir was formed in the 1950’s as a local choir in the village but quickly gathered momentum attracting singers from a wide area and enjoyed both deserved success in competitions and fame for their concerts throughout the UK and abroad. In recent years their numbers had dwindled in some degree associated with brewing discontent in the society. The appointment of their present musical director, experienced choral conductor, Nick Montague has turned their tide of fortune. The singers have a number of exciting gigs this year and tonight they fielded a most effective choir of 20 men forming a nice balance across the vocal range. The choir’s accompanist, Alison Wheeldon, a well know teacher in Buxton, completes the strong musical team and tonight she played unobtrusively yet with some passages of brilliance in quite challenging pianistic territory. Burbage Brass Band started in 1861 for the recreation and morale of the local quarry workers and has been continuously active ever since, even during the wars when bandsmen became comrades. The community traditions remain strong and many of the current members joined as children, being provided with an instrument and free lessons to later join the Junior band and subsequently the senior band. There are currently over 40 players on the books in the early stages of learning the instrument. It is obvious that there is a cohesive loyalty to the band, who rehearse regularly in their own premises re-built 9 years ago. The conductor, Steve Critchlow, now in his 24th year in the role has successfully steered the main band from 4th division in 2011 to the present position in the 1st division of the National Contest scene. Apart from the very last number of the concert, a slightly constrained choral version of ‘The Saints’ in which the band augmented the finale with some effective backing, the Choir and Band performed 2 sets each independently. The choir started the concert with a tasteful arrangement of ‘Anthem’ from the Tim Rice’s musical ‘Chess’. The transit though the very ABBA feel good chord changes set the bar high for the mellifluous quality of this group. Alison’s accompaniment was lovely especially in the expansive chorus in this piece. Their rendition of ‘What a Wonderful World’ demonstrated the superb articulation of lyrics that the Tideswell MVC can achieve. The usual advice for a group of 20 either reciting or singing a verse is to grossly exaggerate the speech elements, to a level at which for individual speaking would sound ridiculous, whereas a group singing or speaking it sounds surprisingly comprehensible. The next stumbling block is to pronounce these elements precisely together so the 20 sound as one! Not many choirs achieve this for more than 10% of the time, which usually results in a muddy vocalization effect without meaningful lyrics. This choir seem to have the mastered the art of sounding as one and the words are crystal clear. Watching the conductor (and singing accordingly) is obviously crucial to success. In the Tideswell MVC their memorization of all the pieces clearly frees up the lines of sight from being ambushed by being transfixed in pages of sheet music. Also Nick works very hard both gesticulating and acting as auto-cue so there is no reasonable excuse for not singing together. ‘What would I do without my music’ was had the intended passion created by coordinated expression and singing with conviction of a group inspired. 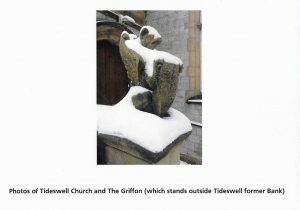 The traditional American gospel song hijacked by the Welsh, Gwahoddiad was actually sung in English with allusions to themes of the cruxifiction of Jesus. ‘The American Trilogy’ is a well know arrangement of songs of the American Civil War, ‘Dixie’ and ‘Battle Hymn of the republic’, and the Bahamian spiritual ‘All my trials’. Popularized by Elvis Presley in 1970’s it works well as a solo, in barbers shop and tonight for Tideswell MVC. Again showcasing the tight coordination of the harmonious choir. The set finished with an upbeat version of the spiritual ‘Gonna rise up singing’. The singing was generally accurate though the coordination slipped a little in syncopation. The choreography may have been rather ambitious at times with some arms flailing against the tide s not so well. The tambourine was a good idea either on or off the beat and probably encouraged the audience to participate in some form of rhythmic clapping. The band opened their 1st set with a lively march ‘Buxtonian’ commissioned for Burbage in 2011. Resplendent in their bright red uniforms trimmed with black and gold, they set their stall as a top class brass concert band. There was a good balance of pitches and the music resonated well in the space of the Methodists’ church building; The nimble articulation of some tricky passages for the cornet section was impressive indeed. The Mozart overture to the opera ‘Abduction from the Seraglio’ which originally appeared in 1782 in Vienna, demonstrated the appeal of classical music to arrangement for the brass band format. The tenors and euphoniums handled the subjects with clarity. Steve’s conducting was in this, and all pieces, solid energetic and giving unmistakable directions which in general the band responded to confidently. The flugel soloist in an arrangement of George Michael’s ‘Faith’ was Josh Tournier. Josh could be said to be one of many true members of the Burbage family being with the band man and boy. He played the lead part with a luscious smooth tone and delivered the more rhythmic sections with spot on accuracy. The all important phrasing is underpinned by good breath control which Josh has mastered. Though I wondered whether some of the band sounded a bit perplexed at times but they got away with it like professionals. For the revival of ‘Batman the Movie’ from 1992, the composer Danny Elfman composed music which really does come over as an archetypal film score reflecting the sinister side of action in Gotham City. The long chords with crescendos and diminuendos captured the mystical suspense from the film and the Burbage Band acting together were able to control the dynamic changes most effectively. After the interval, the band played the Ron Goodwin theme music to the film ‘633 Squadron’. For obvious reasons this music inspires patriotic optimism rather than symbolizing the devastating misery of battle and has become a standard in brass band repertoire. Tonight’s performance was rousing and clear, just like the champion band they are. I expect we will see Burbage at the top slot at the Albert Hall. To show they can create moods of tranquility and sadness, the band played an arrangement an Irish Air ‘She moved though the fair’ depicting the lyrics of a song about an encounter with the ghost of the hero’s late betrothed re-enacting their last encounter in the market place. The rich chords were played with a beautiful smooth tone and articulated with precision. Next up was an infectious toe-tapping contrast with a version of the ragtime march, ‘South Rampart Street Parade’. Fronted by soloists Jenny Conway on trombone with Michael Crookes and Nathan Gratton on cornets, we were transported in style to early 20th century New Orleans. ‘Procession to the Cathedral’ from Lohengrin, 1st performed in 1850, provided a bit of everything for the band’s last big finish. In the opera the heroine having agreed to marry the hero in return for him saving her life is making her way to the ceremony. There is some strong writing characteristic of Wagner in this arrangement and the band play with conviction, successfully pulling out all the rich tonal colours in their palate. The breath control applied by Burbage as a whole band was very effective. The 3 percussionists played with accuracy and panache, enhancing and punctuating the music. Obviously there are some individuals who are clearly more experienced in the ranks than others but putting it in context I felt there were no major “weak links” in the ranks and the band was well tempered and disciplined. Steve Critchlow is to be credited with a great job with this successful outfit. The choir’s 2nd set opened with a rabble rousing run though the narrative song about furniture removers ‘Right said Fred’. Bernard Cribbins must have paid a few bills with the proceeds from this song, which was a popular hit in its day. Although comedy is intended to look playfully spontaneous, the genre belies the coordination and essential planning behind the scenes. The choir managed to convey some humour using relevant props and vocal sound effects. Nostalgia for the piece gained a few more marks to give it an adequate pass for entertainment. ‘Evermore’ from the musical ‘Beauty and the Beast’, though much of it in unison, served to regain the choir’s composure. ‘Let it Be’ often associated with the Everley brothers totally restored the choir’s credentials as a rich part singing chorus. The underpinning bass lines were particularly enriching and resonant here. By the time we got to John Rutter’s ‘For the beauty of the Earth’ the choir was really into it’s stride. Not easy to sing from memory, though of course Tideswell MVC do that anyway (with the “Nick human auto cue”), and tricky for all the parts, not forgetting the pianist. The outcome was a very pleasing performance which came together at the crucial points. Introducing the Jewish ode to peace ‘Ole Shalom’, Nick warned that the room may be reduced to tears. The choir certainly brought out the emotional sentiments and sang the piece beautifully producing a good balance amongst the parts. The programming concept of combining a choir and brass band in the same concert is a well-trodden path. Tonight’s offering was particularly successful resulting in a couple of hours inspirational entertainment, appreciated by the audience. A bonus to have two like-minded organisations on the same bill and who knows, the union may lead to more collaborations from this formidable duo. In September 2019 Tideswell Male Voice Choir will be entertaining passengers on a Fred Olsen cruise to Scandinavia. Founded in 1861, Burbage Band is one of the oldest Bands in continuous existence in the Country. The Band is made up of players of all ages but it can boast that a good 40% are under the age of 18. The majority of the players have all been taught “in house” due to the Band’s policy of the provision of free tuition and an instrument to all who want to learn. 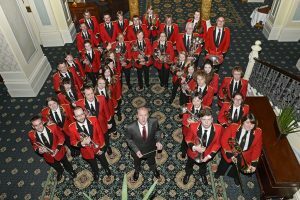 The Band is very proud to have risen through the ranks to play in the First Section in the last few years and is well known for its excellent and varied concert programmes under its Musical Director, Steve Critchlow. The choir is delighted to be sharing this concert with the band as part of the Buxton Fringe. Jeneba is an immensely talented young musician and we are honoured that she is able to join us for this concert. She comes from a highly gifted family (you may have seen her brother playing the cello at the Royal Wedding in May) and is in great demand to perform internationally, both live and in broadcast, so this is an unmissable opportunity.